We invite you to visit our school anytime. You will always be greeted with a handshake and a smile. 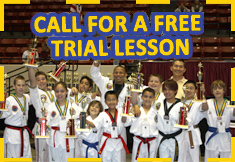 Many of our students and parents come to us after visting several other martial arts schools. The common theme we hear before they join the school is, "It’s very different here." We find that to be a wonderful compliment! We are very dedicated to bringing the best out of our students. Not just in the form of martial arts actions and movements, but also in their personalities. We strive to improve the students’ Self-Confidence and Self-Esteem while teaching them Courtesy, Integrity, Perseverance, and Self-Control. All are part of a complete authentic martial arts education. We feel we’ve found just the right mix of playfullness and seriousness to motivate the different age groups of students in the right direction. Just read what our students and parents have to say.